On Fridays, I have a little ritual of stopping at both Rite-Aid and CVS to check out what's new. 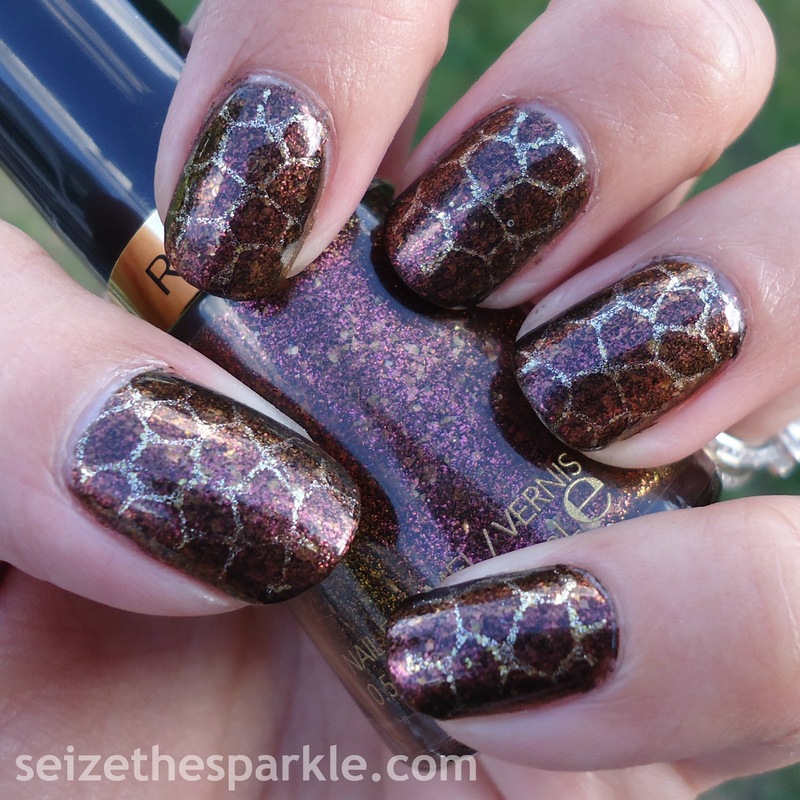 I've been on the lookout for Revlon's Fiery Temptress display, and I finally found it! I picked up my bottle of Untamed and happily walked to the register. 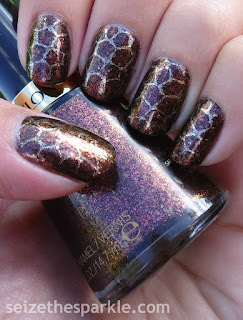 It made me a little bit nostalgic for the days of nail polish hunting past, before Facets of Fuchsia became Scandalous! Untamed is brown leaning burgundy with small gold to red shifting shimmer. Then there's also some larger, irregularly shaped gold flakies in there, too. The shift is a little bit stronger in the bottle than on my nails, but I was working against the setting sun on a pretty cloudy day. So that didn't really help much! 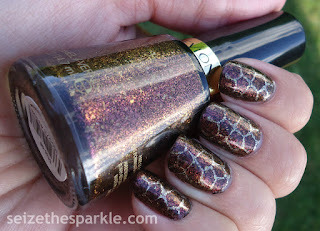 As soon as I remembered my turtle shell stamping plate, I knew Untamed needed to be the base! For the turtle shell pattern, I chose China Glaze Mingle with Kringle. I received a mini bottle in a gift set from Mr. Sparkle's sister last Christmas. I loved it so much that I bought a full size bottle from HB Beauty. It's insanely pigmented, absolutely perfect for stamping or sponging! I love the little hint of glitter that's visible in here, especially considering that this is more of a delicate pattern. I'm not ready to see these nails go, but I'm a day behind and the Challenge marches on! I will definitely be coming back to Untamed, though. I'm not sure if it will be on my hands or on my toes. Either way, it's Fall, on a glitter bender, in a bottle. In my opinion, it's a must-have for every stash!